One reason we love our King of Glory Lutheran Church community is because our members come together to serve one another. 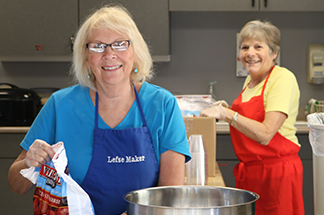 From preparing meals to crocheting blankets, people in need can count on the community and service of our local Christian church members to support each other through various forms. Prayer requests can be public or held in confidence by the staff. To submit a prayer request please fill out the Contact Us form or call the church office at (970) 669-5983. The Prayer Shawl Team meets the first Monday of each month at 1:00 PM. All crochet and knitting levels are welcome. They make prayer shawls to gift congregation and community members going through trying times. If you are interested in more information please contact Barb Brackin-Bartel or the church office.